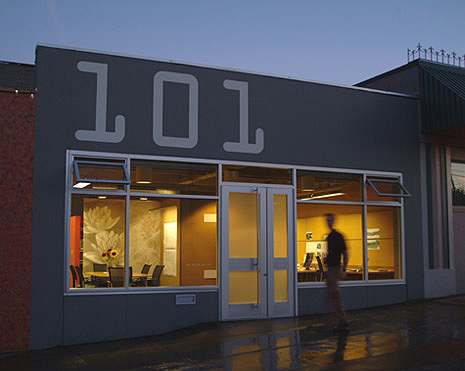 Located in historic downtown St. Helens AKAAN created a contemporary office for three designers in a single-story street front space that was unoccupied for over 30 years. The space presented several challenges, including a deteriorated wood storefront, obsolete building systems, and water-damaged ceilings and walls. The most critical aspect of this renovation was to upgrade the building to improve energy efficiency. Roughly 60% of the budget was spent on the double glazed low-e storefront, a high efficiency zero-CFC mechanical system, an electrical and lighting upgrade, and insulation of the building envelope. With the only source of natural light coming from the storefront, partial height partitions and translucent canvas banners create privacy yet allow natural light to spill into the inner areas. The storefront’s lower portions have translucent window shades while the clearstory is unobstructed. Operable windows provide ventilation and thermal comfort during warmer days. Deteriorated plaster ceilings were removed and suspended ducts and lighting are woven through the skeletal roof structure. Remnants of former locations of joists and walls depict the history of the space, while the distressed wood bench, formerly a ceiling joist, proudly tells its own story in its new life.